The Gold Coast is host to some beautiful weather, tourists come from far and wide to enjoy our warm climate, but we do also get some rain at times. When choosing your shade sail, why not opt for a waterproof one, so you can be protected from the elements, come rain and shine. When planning a BBQ, a shade sail can ensure that all your guests are protected from the sun and can get some light relief from the heat. But what if it rains? Don’t worry. With a weatherproof shade sail from Anthony’s Shade Sails on the Gold Coast you can enjoy your BBQ on your deck safe from the rain. When you use a weatherproof shade sail from Anthony’s shade sails on the Gold Coast for your carport you can enjoy getting in and out of your car without getting wet in the rain. A waterproof shade sail will also prevent your car getting dirty, keeping it perfectly clean and dry. A waterproof shade sail isn’t just great for the home, they can also help with your bottom line in a business too. A shaded café area adds more usable real estate, but if that area was also waterproof you can ensure you have maximum seating capacity no matter what the weather. Don’t compromise your bottom line when you can enjoy a shade sail that protects from the sun and rain. When it comes to shading your outdoor area why not get the best of both worlds with a weatherproof shade sail. 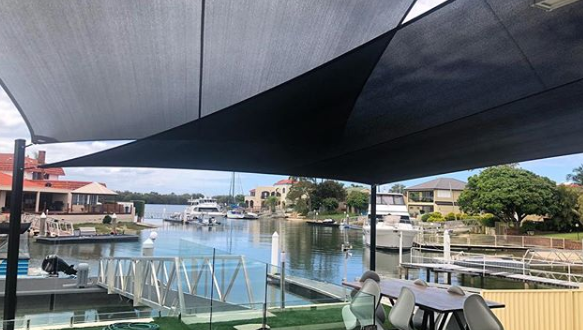 Anthony’s Shade Sails on the Gold Coast can customise a shade sail to your specific taste, we can customise the size, shape, material and colours to you. For affordable all-weather shade sails, call Anthony’s Shade Sails today.